Nicaragua’s Masaya Volcano is home to one of the world’s newest lava lakes and has become a test center for software that could become an early warning system for volcanic eruptions. Earlier this summer, Scott Parazynski, Arizona State University Explorer and professor of practice in the School of Earth and Space Exploration, was part of a team that descended 1,200 feet into Masaya Volcano and placed a sensor network designed to collect data on volcanic activity. "Expedition leader Sam Cossman and I were the first two humans to rappel down to the lava lake and set bootprints there," says Parazynski. Several other scientists, engineers and filmmakers followed suit during the month-long expedition. Masaya Volcano, one of the most active on Earth, stands just 12 miles south of Nicaragua’s capital, Managua, home to more than two million people. The volcano continually emits large amounts of sulfur dioxide gas and has a history of erupting ash and steam. Scott Parazynski, ASU Explorer and professor of practice, descended into an active volcano in Nicaragua to help "wire" the volcano with a network of sensors to provide advance notice of eruptions. Image by Scott Parazynski. "It was an otherworldly experience being down at 'Level 0,'" says Parazynski. "We were standing perhaps 30 feet from the lava lake, with waves of molten rock crashing on its shoreline." Parazynski and twenty other researchers, mostly volunteers, made up the science team that placed the sensors. They were led the expedition organization Qwake, and assisted by local Nicaraguan support staff that provided mountain rescue help, paramedics, and riggers. “This was an expedition of passion for the team,” says Parazynski. The team descended into the volcano using a steel zip line cable and heat-resistant ropes developed by professional rigger Mike Thompson. This allowed the explorers to get down to the lava lake and back up quickly and safely. The explorers placed 80 sensors built by Honeywell around the lava lake at various levels. The sensors were attached to stanchions bolted to rock at the bottom of the volcano and around the walls of the volcano’s caldera. Over the next several months, the sensors will gather data on hydrogen sulfide and sulfur dioxide levels, temperature, humidity, atmospheric pressure, gravity, and other factors. The project will combine General Electric’s “Predix” platform and artificial intelligence to develop predictive analytical techniques about eruptions and other volcanic activity. The overall goal is to create the world’s most advanced early warning system for people who live near volcanos. 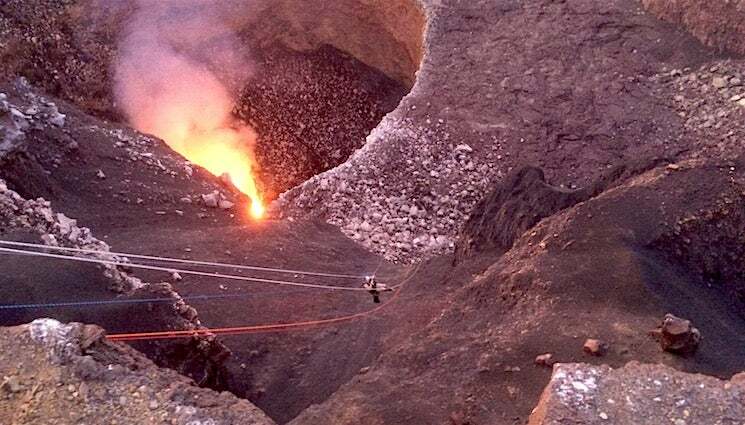 Top image: To emplace the sensor network within Masaya Volcano called for using a zip line to move people and equipment between the rim and "Level Zero," where the churning lake of molten rock lay just a few feet lower. Image by Scott Parazynski.